Drive System: There are typically 3 types of drive systems on a router including Rack and Pinion, Lead Screw, and Ballscrew. Ballscrew is the most expensive but also withstands larger material size and yields better accuracy. Motor System: Servo Motors are best for high speed, high torque applications involving continuous load changes while Stepper Motors are less expensive and best for low-medium speed, high torque applications. Spindle: Spindles are motors that do the actual cutting with the use of a cutting tool. Look at the capabilities of the spindle including RPM, torque, power requirements, load ratings, collet type and size, spindle motor type, etc. Automatic Tool Changing System (ATC): If your application requires using more than one tool, then an ATC System would help to change tools efficiently, reduce operator error and decrease job times. Table size: Buy a large enough routing machine that can handle your typical material size while considering room for expansion or jobs that require longer material to be processed. Machine Weight: The heavier the machine, the better it is constructed, the better it performs. However, if your business requires frequent transportation of the machine, you may want to look around for a strong and rigid machine that weighs the least. Software: Knowing the machine does what it is programmed to do, invest in advanced software that provides accuracy, efficiency, regular updates, etc. If you require manufacturing complex parts, a specialized software package may be required. Vacuum: The more hold down strength, the heavier material you can cut. Look at how much vacuum pressure the machine has and how well the table holds down material. Dust Collection: CNC Routers can generate a lot of sawdust. Vacuum Systems can clean up the atmosphere and the overall area of operation. Check to see approximately how much dust will be created, what type and weight of waste needs to be collected, and where should you place the vacuum system so it works most effectively. Features: Look for Router systems that offer a variety of features. Simply put, machine features essentially make things easier for you. You want a machine that is productive, can process efficiently and requires little to no supervision once the settings are in place. Router bits: Purchase quality router bits with a long life. Once purchased, make sure you maintain and care for them as it is important to always work with a sharp router bit. 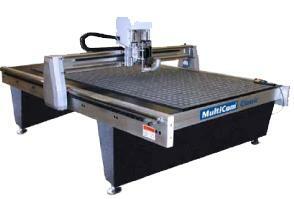 Costs/Budget: The cost of a CNC Router depends on the brand, model, features, options, size, construction, and more. From entry level to high-end Routers, they can cost approximately $5k to over $150k. Keep in mind there are also the costs of installation, training, software, warranties, preparation, consumables, etc. Do research and aim to purchase a reliable and high-quality machine at the maximum amount you can afford. Click Here to Subscribe to our monthly newsletter for more CNC Router tips, information on our available products and industry news.